The acquired immunodeficiency syndrome (AIDS) and AIDS-related complex (ARC) are caused by the retrovirus now designated the human immunodeficiency virus (HIV)1–4. The spectrum of HIV infection in adults and children includes neurological dysfunction in the majority of patients5–9. 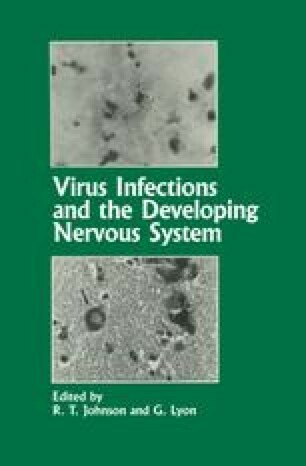 It has been hypothesized that the progressive encepalopathy seen in children with HIV infection is due to direct brain infection with this retrovirus5, 10–12 Evidence in support of this hypothesis includes the transmission of HIV infection to chimpanzees using brain tissue13, the isolation of this virus from brain and cerebrospinal fluid (CSF) of patients with AIDS and ARC14–16, and the identification of HIV genome in the brain of adults and children with AIDS encephalopathy12. Further indirect evidence comes from analogies with animal retroviruses of the lentivirus subfamily, such as visnal17 and the newly described STLV–III in macaques18, which are known to be neurotropic.